Circuit Rider a musical experience featuring well-loved gospel artists is the real-life account of the brave men and women who blazed the trail in the early days of America sharing the gospel with people of every race and nationality living in little towns and settlements across the nation. Award-winning artists tell the stories of these saddlebag preachers and the hardships they endured as well as stories about revivals baptism sanctification and suffering that set the stage for the church today. An all-NEW musical documentary capturing LIVE performances from some of the most treasured artists on the Homecoming stage. Circuit Rider DVD by Gaither was published by Gaither in November 2016 and is our 1684th best seller. 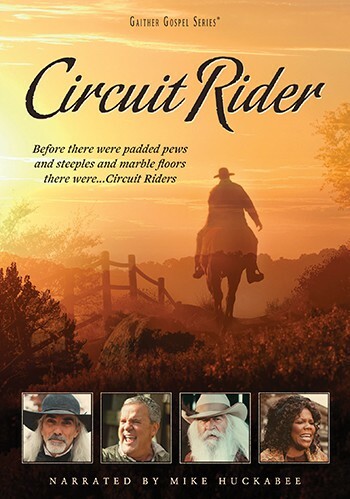 The ISBN for Circuit Rider DVD is 0617884908690. Be the first to review Circuit Rider DVD! Got a question? No problem! Just click here to ask us about Circuit Rider DVD. Can this be viewed on uk dvd players? A:The DVD is region free, so will work on DVDs in the UK as well as anywhere else in the world. Thank you for using the Q&A Forum.